Here is an update of the current situation as we know it at Te Arai North. SAVE Te Arai and other groups have been diligently working behind the scenes in communication with Council, Councillors and members of Parliament to try and get a better outcome than what is currently being forced upon us. Many have read the article and although it touches on some of the issues the the community is facing with the Tara Iti/Te Arai developements it seemed to dwell on the concept of the community not wanting new residents where the real issues facing us today are the developers continually trying to marginalise access to the reserve, completing large scale works and removing resources from a public reserve as well as completing illegal works on weekends (the ford/dam issue) under the hollow guise of emergency repairs – repairs only necessary because they have been increasing the height of the Te Arai stream obstruction. The large scale earthworks that have occurred in the reserve after the it was vested to the council – the removal of 58,000m3 of sand to use as fill on private land. That twice the developer has gone to the Te Arai Stream ford in recent months and illegally worked on it, without permission from council and that the most recent works have prompted the council to request they apply for retrospective consents. If any other member of the public had entered into a reserve and decided to dam a stream we would be facing a lawsuit. The video gives a better overview of the issues, but it is important to note that SAVE Te Arai is not the only community group that are working for better solutions. There are many other issues that relate to PC166 and now the Auckland Unitary Plan that are of grave concern for the community and the reserve. At end of May developers held a meeting with community groups to inform them that they had reversed their decision to secretly remove the Pacific Road carpark and move it inland 420m. At the same meeting the community groups were told that the developers are pushing ahead with realigning and reducing the width the easement to the south, around lot 20 (which straddles Pacific Road as we know it now), and bulldoze more land to create a new entrance to the existing beach carpark approaching from the South. We have previously had assurances from both Mace Ward (General Manager of Parks) and Matthew Vujcich (Northern Parks Manager) that their goal was to not allow any more earthworks to occur in the reserve. These assurances are in direct contrast to the works that the developers are proposing in the public reserve. We have requested detailed plans from council of the proposed earthworks but have not received any, asking the question if there are any? These works in the reserve are being pushed through without an official Reserve Management Plan from the council and we have been informed that such a plan (which is critical to the care and development of the reserve) is at least a year away. The developers have forged ahead with their plans even after SAVE Te Arai and others registered their opposition with council to the plans. 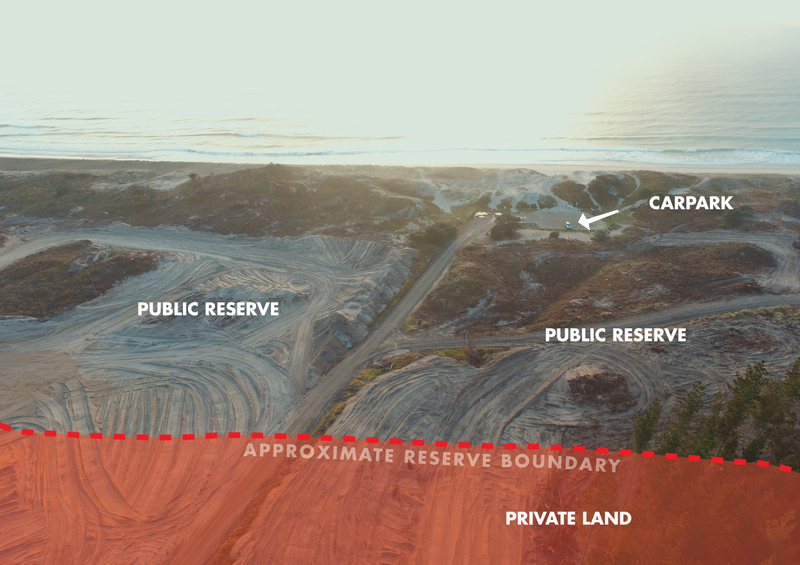 The Minister of Finance does not believe that the community surrounding Te Arai deserves a true democratic process and the MoF approves the alterations to the easement without public notification. In December 2015 under the agreement of council and the developers, the developers submitted a subdivision plan to LINZ which was approved, that provided for a 50m wide easement the entire length of Pacific Road to the reserve. During this process they were concurrently submitting consent applications to council to choke the seaward end of pacific road down to 20m – initially for a pedestrian only easement and now after public uproar it will be for vehicles as well. Still only 20m wide – a loss of 30m in width that was widened to ensure safe use for cars, motorbikes, pedestrians, cyclists and horses. How can council allow for such a dramatic increase of use on the easement without enforcing the original 50m width? We have raised the question directly with Clr Greg Sayers and Mayor Phil Goff. CALL TO ACTION – Send an email to the responsible ministers to ask that the public be heard. It will only take a couple of minutes and will help get our message across. Click this link to go to our ‘Take Action Page’ for instructions. Many have read the post about the illegal works occurring in the reserve that relates to the extensive earthworks adjacent to the ford (now a dam). STA along with other community groups have had several exchanges with consents and compliance departments within council. Council are slowly following this up but have asked the developers to apply for retrospective consents for the works, which we find alarming that the council are not enforcing a reinstatement order back to pre 2012 levels. The dam is there solely for the purpose for Tara Iti to draw water out of it for the private golf course. The pump station (20ft container) is on public land. We have been informed by the developers that there is ongoing logging occurring in future lots 21-27 south of Pacific Road, as land owners they are allowed to remove the pines, so please be careful along Pacific Road as there will be large trucks and equipment. We will be keeping a close eye on the situation and ensure there is no impact on public access/safety or the reserve. Please note that it is breeding season for the fairy terns, if you are walking or horse riding along Te Arai (particularly around the stream mouth) please keep an eye out for signs and roped off areas. The nests can be very hard to spot and are often left unattended while the parents are out foraging. NZFTCT volunteers are there most days keeping an eye on the nests and keeping them safe from predators. These are not the only issues surrounding Tara Iti and Te Arai. SAVE Te Arai is not against development but we are against developers that have no regard for the community or the public environment. The Darby Partners state their developments ‘tread lightly’ but they don’t seem to mind stomping heavily on the community around them.